Foredom Miniature Carbide Ball Set Style AK211 7 piece. These miniature carbide ball burs come in a plastic case. They are ideal for use on hard wood and most metals including stainless steel steel alloys cast iron etc. 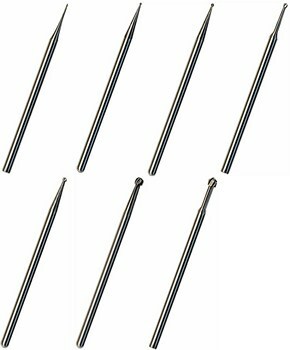 2.35mm (3/32") shank. 1-3/4" overall length. 100000 RPM Max Speed. Made in USA. Includes bits 10221 10222 10223 10224 10225 10226 and 10227.